Garlic is grown for its medicinal and culinary properties, and it’s used successfully in the kitchen to spice up the food. Garlic has two distinct varieties: common white garlic and red garlic. White garlic is a rustic variety, productive with good preservation qualities and strong flavor. Red garlic is early, with sweet flavor, is less cultivated due to its sensitivity to moisture and the difficulty of preservation. 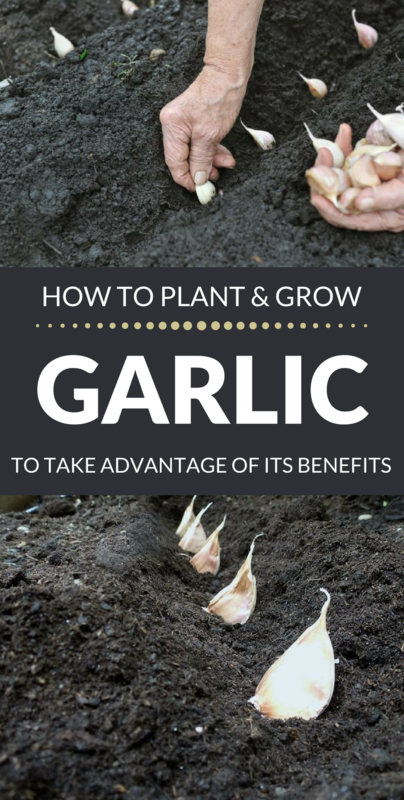 Garlic needs a prolonged luminosity (helps differentiate the bulbs), grown in shady areas makes a single bulb. It is advisable to cultivate garlic on land exposed to south, with good drainage of water, rich in slightly calcareous nutrients. Can be grown together with parsley, cucumber and tomatoes! Garlic sowing is done, preferably using peripheral bulbs from the end of September until the beginning of November. Planting is done at a depth of 5 centimeters, at a distance of 25 centimeters between rows and 12 centimeters between plants in a row. On wet and compact land, garlic can be grown on the billiards to avoid water stagnation. Fertilization is done with manure or well-ground compost about 300 kilograms per 100 square meters that is incorporated into the soil when digging. Ground preparation is done in the summer by digging at a depth of about 20 centimeters. Before sowing, the ground is squashed and flattened. In the spring, two dusts are needed to ventilate the ground and eliminate weeds. Harvesting can be done at the end of June in the beginning of July. Garlic is preferably harvested on a sunny day when the land is dry. The harvested bulbs can be left for a day in the sun to dry. For those who don’t want to crossbreed garlic too much, it is possible to mulch with a layer of straw at a 5 cm height.